MainAll NewsForeign AffairsWill UNESCO ever condemn Temple Mount terror attack? Will UNESCO ever condemn Temple Mount terror attack? Israeli delegation pushes UNESCO to condemn deadly terror attack which took place at UNESCO World Heritage Site. But will UNESCO act? Will the United Nations Educational, Scientific and Cultural Organization (UNESCO) stand up and condemn a murderous terror attack which took place on a UNESCO-designated World Heritage Site, and the use the Heritage Site to store weapons for the attack? 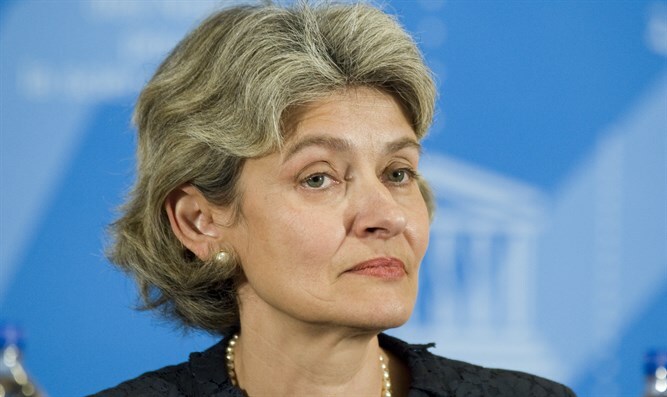 That is the question Israeli envoy to UNESCO Carmel Shama Hacohen posed to the international body on Thursday in a letter to its director-general, Irina Georgieva Bokova. While UNESCO has designated the Old City of Jerusalem, the Temple Mount included, as a UN-protected World Heritage Site, since last week’s murder of two Israeli Border Police officers by a gang of Arab terrorists, the UN organization has yet to issue any form of condemnation against the terror attack. In his letter, Shama Hacohen urged UNESCO to stand by its pledge to protect World Heritage Sites and condemn the use of one in facilitating Friday’s attack. Authorities believe that the three terrorists responsible for the attack stored their firearms in one of the mosques on the Temple Mount with the help of officials from the Waqf, the Islamic trust charged with managing the holy site. “On July 14th 2017,” wrote Shama Hacohen, “three terrorists, armed with rifles and pistols, launched an attack on Israeli police officers near one of the gates to Har-Habait (Temple Mount) in the Old City of Jerusalem. Several Israelis were seriously injured, amon them two Israeli police officers who were killed. “The Old City of Jerusalem and its Walls, including Har-Habait (Temple Mount), is a UNESCO World Heritage Site, and as the Director General of this Organization, I urge you to strongly condemn this deadly and shameful attack, [which] occurred within a UNESCO World Heritage Site.